The Jumbo Flob a Dob™ is a giant supportive seat for one or a very cosy seat for two. Supplied with ample amount of bead, providing all the necessary support for your back, neck and head. Complete with complimentary top-stitch detail to all seams meaning this beanbag will not only look the part, it is made to last. Our Trend™ fabric is comfy, strong & colourful. The fabric can be wiped clean and machine washed at 30°. You may want to consider taking advantage of the easYfill™ liner deal (discounted when bought with this beanbag), this will enable you to transfer the beans from the beanbag if you wish to machine wash it. Excellent product, large and comfortable. Fast delivery. Perfect size for my 6ft husband. I use it whilst watching tv and playing on my Xbox, it's comfortable and offers pretty good back support. The product seems to be good quality. The exterior is smart but looks hard wearing. The bean bag is comfy and flexible. I've sat in it while listening to music and watching TV. Excellent to lounge on, Easy to fill. Worth the purchase. 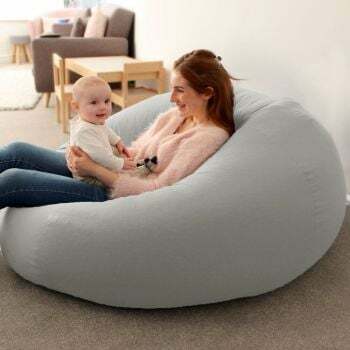 We ordered a Jumbo Flop a Dob" beanbag for our daughter.\nIt arrived the next day as promised and we are all delighted.\nIt's big enough for two. For bedtime stories or when her friends come over to play.\nWe liked it so much, two months later we ordered another one for our son.\nI'd highly recommend.\nPS Name is excellent too !" every one in the family uses this fab bean bag - while watching TV and gaming, to relax on and to rest our feet also! Great quality. We have bought 2 for the office, and quality is great. Super big beanbag! Love it. Bit of assembely required which wasn't too bad. My son uses the bean bag. It is a good quality bag and very strong.